If you're in the market for a New or Used vehicle, DO NOT purchase any after market dent program that may be offered. "The dent warranty's are not only overpriced, but the claims process is time consuming and the dent company doing the repair isn't always reliable." "What if I am looking for a program, where do I find one? ", you ask. "I have a No Dents Program that provides more in benefits and is less than $300 for a term of 3 years. There is no other company or program than matches the value and quality of my program. Here is the comparison between my No Dents Program and the After Market one. You can see the significant difference in coverage and price between the two programs. The No Dents Program provides the customer a tremendous opportunity to maintain the value of their vehicle. I have established my company as the premiere company in my region. My business philosophy has always been to ensure the customer is completely satisfied. I am honest and straightforward with every customer. I was handling some of the after market warranty claims and realized the outrageous cost that the customers paid for the after market program. I came to the conclusion that I could provide a better program for less for the customers in my region. 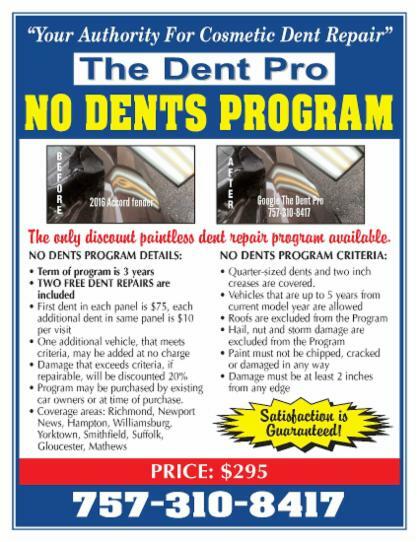 Also, as you may have read in the comparison between my No Dents Program and the Aftermarket warranties, you don't have to purchase a vehicle to obtain my No Dents Program. The only requirement is that your vehicle must 5 years old or less. For instance, if it's 2018 the year of the vehicle can't be older than a 2013, 5 years old. If you want to move forward, simply click on this link: Registration Form. Personal checks are fine and are made to The Dent Pro. If you prefer to use a Visa or Mastercard, make a note on the Registration Form and I will contact you to process the payment. Thank you for taking the time to consider my No Dents Program.